superdumb supervillain: Thomas the Train Live! When I was little, I used to love going to the big traveling roadshows. The excitement of the massive crowds, the bright lights and , of course, the omnipresent souvenir stands were always worth the wait. I was especially enamored of the Ice Capades (oh, wow… I just realized that's a pun. I can't believe I never noticed that. I feel really silly now.) because ice skating was awfully exotic to me– our temperatures rarely dropped below 60º even in the dead of winter. The shows that had tie-ins with my favorite TV and movie characters were always brilliant, too. I remember seeing Big Bird at the Waikiki Shell and being totally starstruck! When we received an offer from MomSelect to see Thomas & Friends Live! On Stage: A Circus Comes To Town here in Wichita, I accepted without hesitation. Jasper and Roo haven't been to see this kind of show before and they love playing with Thomas toys, so I am sure they will go completely nuts! Thomas & Friends Live! On Stage will be at Hartman Arena on Sunday May 24th. 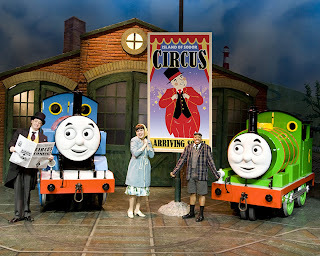 To find out if the show will be playing near you, check the Thomas & Friends Tour Schedule. Thanks to MomSelect for giving us this opportunity to enjoy some family entertainment! Oh that will be fun!! Jasper and Roo will have a blast :) That's wonderful, can't wait to hear what they thought! That's great! They have a souvenir shop, right? That should be one fun show, they are going to love it, I'm sure! Jasper is goina flip, isn't it? This how was so fun! That sounds so fun! I wish SoJo would sit still for something like that, since I had a chance to go to the circus but passed since he's too active. Maybe in the fall! I'm sure your two are going to love that, and you probably will like it too.